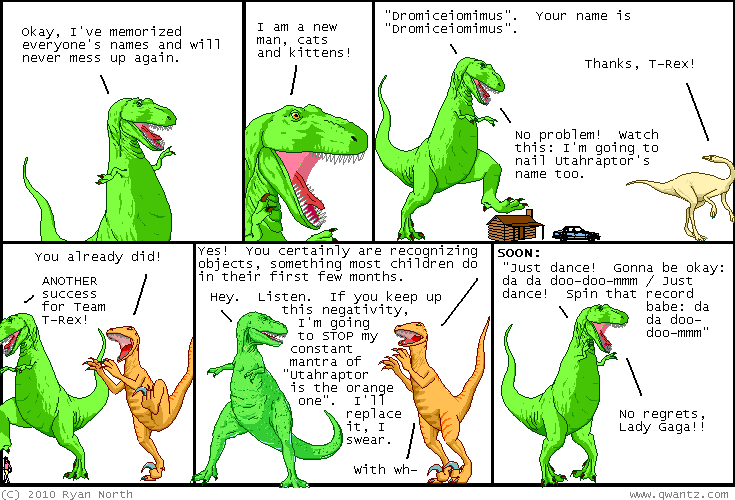 Dinosaur Comics - September 29th, 2010 - awesome fun times! –Sheesh! This instantly raised the rating of our story from G to PG-13! September 29th, 2010: It's fall! It was fall a few days ago, actually. BUT IT'S OFFICIALLY FALL NOW, because the footer way down at the bottom of the page has been updated to reflect this most pretty of seasons! It's T-Rex and Dromiceiomimus, going for a stroll out by a lake. If you're reading on RSS, come see the site, because then you'll see how sweet this footer is! I can't promise balls will be tripped over how nice it is, but... they might. It was done by Danielle Baskin, who did the summer footer too. She does some neat stuff! I have one of her bike helmets (custom bike helmets, you guys!) and they're great - check them out! She's also started a side project of doing 78 bike and skate helmets based on tarot cards and they are also wicked sweet. Linking to her is the least I can do after getting such a nice footer (and after she made all the changes I needed to get it to work properly!) but they're also Legitimately Awesome Helmets and you'll probably like them! Anyway I am always excited to change my footer and I still really like how they make it look like the entire Dinosaur Comics website takes place in the sky above this little scene.